Passengers made the first journey on an electric train between Liverpool Lime Street and Manchester Airport last Thursday. Southern, which in turn is receiving brand new EMUs. The 0616 Liverpool Lime Street to Manchester Airport service was the first train to use the newly electrified route following the completion of work by Network Rail. 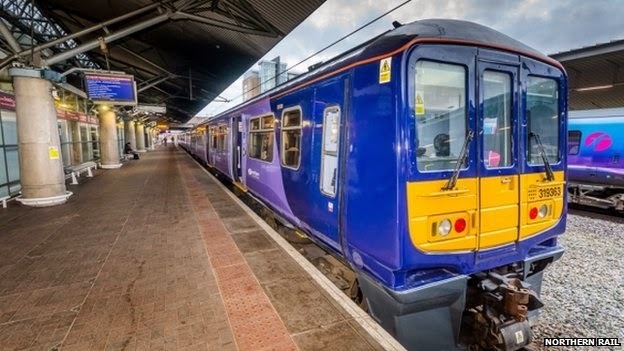 The completely revitalised Northern trains have had extensive work done ahead of their maiden journeys with striking new look exterior paintwork, as well as refreshed and modernised interiors which include new paintwork and improved seating for a more comfortable journey. Newly-installed on-board information technology means customers will be better informed about their journey while travelling via new digital screens and automated audio announcements to support the conductor. The trains launched today are first of a 'new' fleet of 20 trains which will be rolled out on the route in coming months. The electrification of the line means that passengers are able to travel on electric trains which are quieter, more reliable and have more space. But work on the 32 non-electrified routes looked at by the task force will be dependent on Network Rail. Twelve lines were classed as Tier One, with the remaining routes split between Tier Two and Tier Three. Twelve rail lines across the north of England have been prioritised for electrification. The Calder Valley and Liverpool to Manchester via Warrington Central lines are seen as most in need of work. A cross-party group set up by the government to advise on rail investment has published a report recommending which routes to improve first. The "Tier One" lines should be considered for the next funding cycle of 2019-2024, the task force said. Electric trains accelerate faster than their diesel equivalents and would allow for shorter journey times, according to the report. The North of England Electrification Task Force said new electric trains would also mean less overcrowding on the routes. A number of routes across northern England are already being electrified, including Liverpool to Wigan and the Manchester-Bolton-Preston-Blackpool line. Transport Secretary Patrick McLoughlin said: "I want to see a rolling plan for further electrification and this study will have a vital part to play in setting the agenda for 2019 and beyond. "Network Rail will take the task force's findings into account as it develops its nationwide plan to improve the nation's railways."